Quick fix cookies are what I'm all about today. Something that doesn't require soft butter because all of my butter is in the fridge... Doh! I wasn't planning to bake cookies today but sometimes life is more exciting when you're not prepared. Except when you have final exams, or a job interview, or a driving test, or a dream to climb Everest - best to be prepared for that. Cookies aren't as exhausting as climbing mountains so this is totally doable despite the availability of soft butter. It's hard for me to bake a cookie that doesn't contain chocolate. 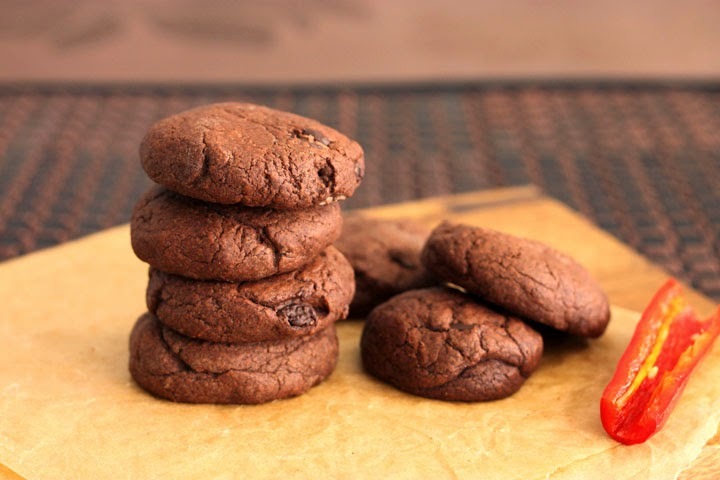 This one is twice the chocolate - cocoa cookie with bittersweet chocolate chips. There's plenty going on in here besides all the chocolate. I've added some chili and spice for an old Maya kick. When cocoa beans were first discovered in Mexico by civilizations known as the Olmecs and the Mayans, they would combine bitter cocoa bean paste with ingredients that were native to the land, including sugar cane, cinnamon, chili and vanilla. Chocolate was first consumed as a hot frothy drink before it was ever made into silky smooth bars. 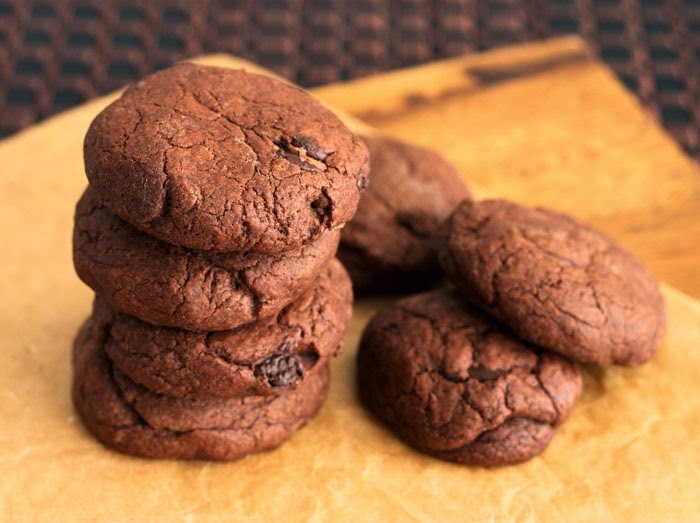 These cookies are inspired by that exotic drink, as well as my desire for fast results when I have a hankering for chocolate. Now we need to get our deeds together to get these cookies going. Apparently cookie dough doesn't make itself. You'll need three bowls, a whisk and a wooden spoon. Maybe there's a bit of clean up involved, but it's smooth sailing. Promise. First we melt some butter and bittersweet chocolate in a bowl and set it aside to cool slightly. Make sure it's bittersweet chocolate. That's 70-72% cocoa solids. Believe me that these cookies will be sweet enough because cinnamon has that magical effect of making things taste sweet despite barely containing any sugar. Then we combine just under a cup of flour, cocoa, cinnamon, ground chili and salt together in a medium bowl and set that aside too. In a third bowl, combine the egg, vanilla extract, brown sugar and white sugar and whisk vigorously until pale and thick. Stir in the melted chocolate mixture and then stir in the flour mixture. Stir in the dark chocolate chips or chunks. Simply set the bowl of dark chocolatey batter/dough aside while you preheat the oven and wash those bowls (or not, let's be honest). It will look like brownie batter at first as it should since this is essentially a brownie recipe with more flour added. This is how we make cookies when we don't have soft butter ready. This is an functional step though. As the mixture stands, it will thicken and firm up so that you can roll it into balls if you choose. Otherwise you can spoon and drop it onto the baking tray. 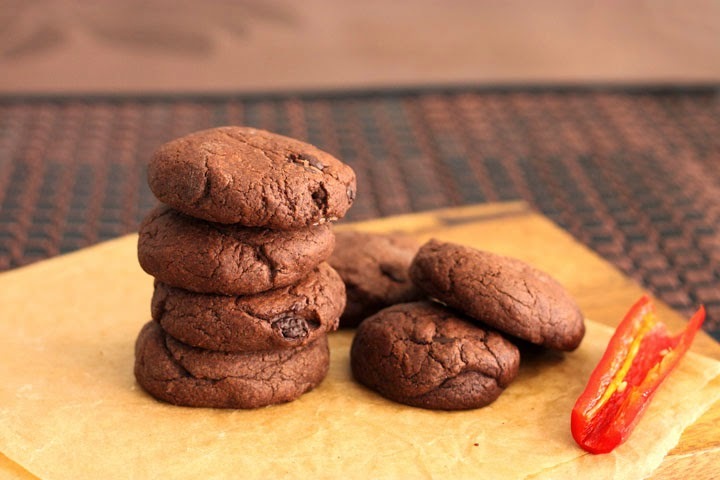 These Maya Chocolate Cookies have a dense fudgy texture - not wet - but dense. Because there's not a ton of air mixed into the batter, they actually last a long time in an airtight container at room temperature. I kept mine up to a week without them going dry. Spice up your life and do it with chocolate. That's what I'm sayin'. Gently melt together butter and chocolate in a small saucepan over low heat and set aside to cool. In a medium bowl, sift flour, cocoa powder, cinnamon, chili and salt. In another medium bowl, whisk egg, vanilla and both sugars until very pale and thick, about 2 minutes. Stir in cooled chocolate mixture. Add flour mixture and stir to combine. Fold in dark chocolate chips or chunks. Let dough stand for 20 minutes at room temperature. Meanwhile, preheat your oven to 350°F/180°C and line 2 large baking trays with parchment paper. When ready to bake, roll heaped tablespoons of dough into balls (12 balls for larger cookies) and place on prepared baking trays, spacing them 2 inches apart. Flatten dough balls slightly and bake 11-12 minutes, until the surface looks a bit shiny and the cookies are set around the edges but slightly soft in the center. For smaller cookies, make 15 balls, flatten and bake 9-10 minutes.